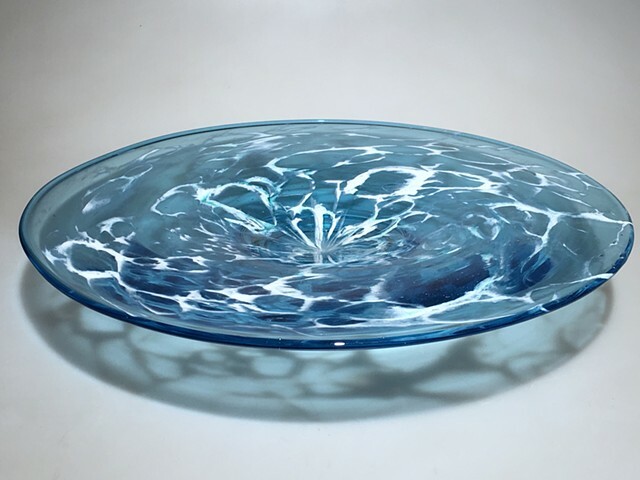 The Sea Foam Platter Is created by adding pure Aqua Blue Glass color to a blown molten bubble. The bubble is then encased with clear molten glass. Shards of clear glass are added to the molten layer of glass and sifted with white glass powder which creates the foam pattern. After the pattern is completed the patterned bubble is then blown to shape and transferred to create the final shape.